I have a 1970 something (71or72) I think Les Paul Recording Bass. Thecontrol plate has been hand made out of a piece of wood. Its OK, butlooks out of place. I would like to make another one. I need apattern or tracing to do a layout. Can you help in any way? I would also purchase one if available, but don’t think they are. You might want to check these folks out. I've never contacted them myself, but I've run into their web page several times. Not many people offer these. Ask yourself: What would Keith Richards do? I would also purchase one if available, but don't think they are. The Les Paul Recording II (Iridium) came today, I gave it a pretty good test drive, but have much more to do. The two guitars sounded more alike than I thought they would, since they really are nothing alike at all. The new guitar had a very clean sound in Low Impedance, with sustain that went well past the 20 second mark, due to the maple top?? 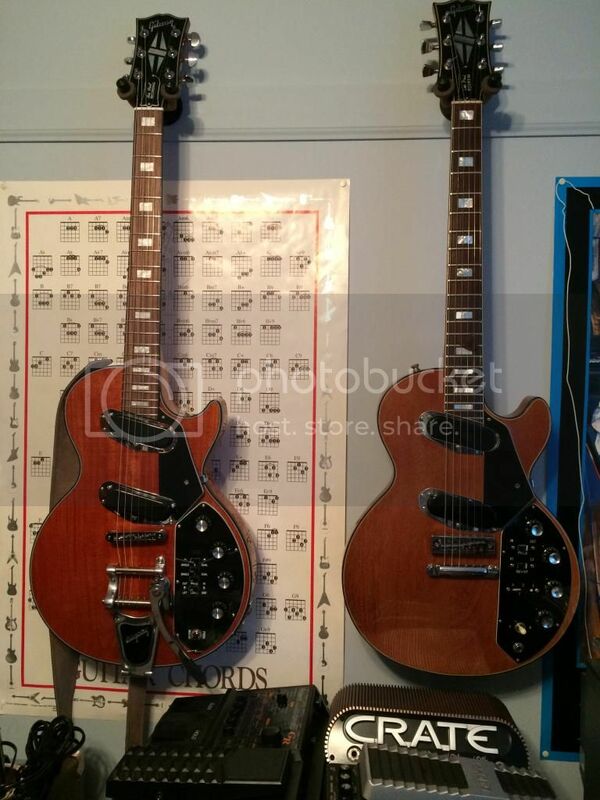 I still like the feel of the neck of the 1973 better. The fret board seems overly light in color, it is suppose to be rosewood, I hope it is. My guitar only weighs 8lbs, 6ozs. I think it was one of the lighter ones available. Many are over 10lbs. It played well right out of the box. A three wire, Low Impedance chord was included with the guitar, the same chord I've been using with my Les Paul Signature. Being able to switch the pickups into single coil mode was different for this beast, I wasn't too noticeable in Low Impedance. Kind of odd without the Decade feature. I ran it into two amps at the same time & did need the Ground Lift feature & it did work. I like the look of those frets, they look far larger than on my '70. Are they original size? That is something I have notice about mine is that the frets are really low profile, this is the "fretless wonder", I suppose. I'm a bit heavy handed, and my fingers touch the fingerboard sometimes, unlike my '07 LPS which has taller frets for sure. It takes such a light touch to play this one, I feel like a gorilla, <never mind the mirror> Sorry about the not great pic. The guitar in your pic has been re-fretted. So comparisons with the original are not valid. Thanks Dave, how does one go about knowing that? These look pretty vintage, super low and wide. 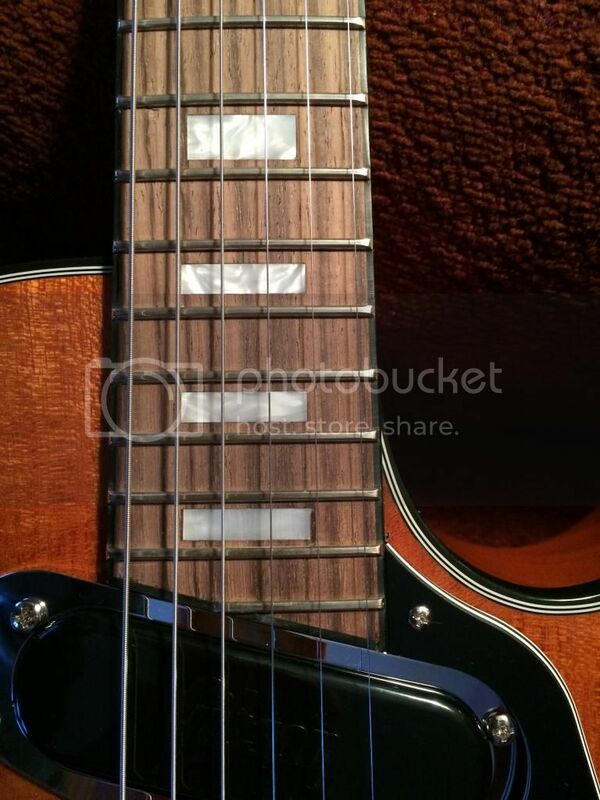 Are the fret ends are covered with the binding? I can't see clearly on that picture. But the absence of the plastic fret ends (nibs) is a very clear sign of the guitar has been refretted. When the old frets were removed the "nibs" of the binding were filed away and the new frets were installed over the original nibs. I think I see what you're saying. I will try to get a better picture up. 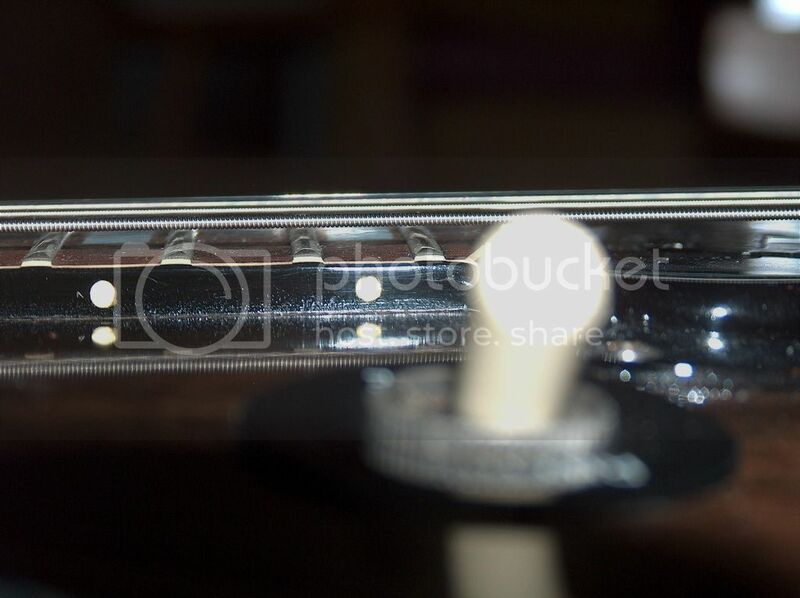 I think I can see where these "nibs" are removed/missing, a slight notch of sorts in the edge of the binding at the fret ends. I believe you guys are right, a fret job sometime in the past. Unfortunately I have no LP with a bound fretboard to compare. But also, if re-fretted, a well done job, I am getting used to the light touch required, and I do like the low look, it does seem to fit the instrument. Note, how tiny the nibs were on older Gibsons. These gracefully crafted fret-ends save the owner of the instrument from many headaches associated with the wider and taller new ones. Nib separation, (strings being caught by gaps between frets and the nibs) was never an issue with these. Another one of a kind, custom Les Paul Recording. It looks genuine enough - different body cap and gold parts. But if it is a genuine 73 why is the Bridge "wrong"? It's not just a replacement - the post holes are "off-set". The very earliest LPR's had the ABR style bridge, I don't think Les Paul Customs had the harmonica bridge, my '74 doesn't. The extra thumb screw is sort of odd. Are they using them to cover up a modification? Agreed, the serial number is much earlier than mine so is it perhaps earlier than '73?? Bence pointed me to this thread and was wondering if someone could help me out. I have a 1974 Les Paul Signature guitar and I would like to play it more. One thing I noticed is when I plug into the high impedance jack I have to run through a preamp to get any volume. I read the same resistance on the high impedance jack as the low impedance jack (~25 ohms). So it makes me think the high impedance transformer is either bad or missing in the guitar. Looking in the cavity I can't see a transformer but that might be because the mirror is clunky and I can't move around much in the f hole. Has anyone read the resistance on the high impedance jack? I would expect the extra windings to read higher than the low impedance jack. Reading through the thread, I see I could get something like the Shure A95U or A85F transformer and just use the low impedance jack. I will probably do that, but would like to confirm what is wrong with the high impedance jack if at all possible. Just to make sure I understand the wiring, the low impedance is a balanced connection? Correct? 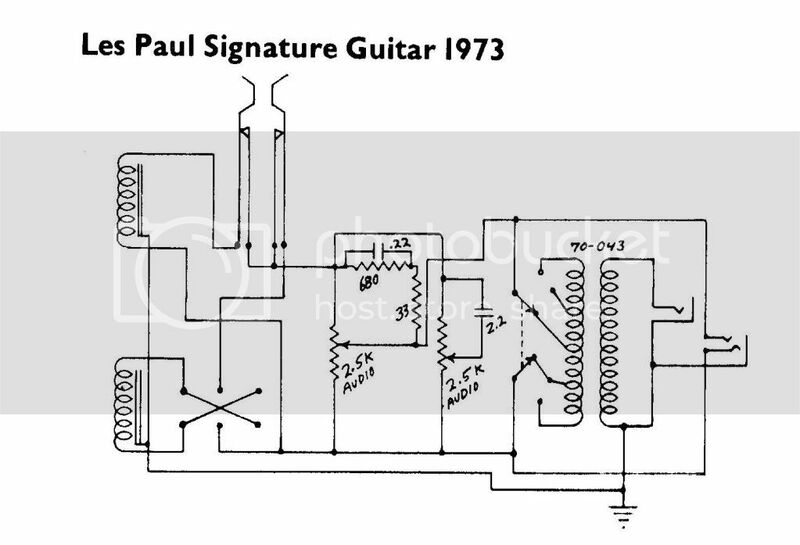 I took a few readings on my 1974 Les Paul Signature. All readings are with the Volume & Tone on "10" & the Pickup Selector Switch in the "Center" position. High Impedance was at 3.75 K-Ohms, measuring on the end of the guitar jack. The "Level Control" switch made no difference. Low Impedance, using a balanced cable with a Stereo 1/4" jack at one end & a Female XLR jack at the other. Reading between pins 2&3. *Note, My meter had a reading of 1 Ohm when I tested it for "0" at the 200 Ohm setting. The Les Paul Signature has a balanced 3 wire jack on the side. A chord that you can buy right off of the shelf just about anywhere will allow you to plug into a PA or an amp that has a low impedance jack. Do you think anything was altered? The schematic makes it look like the transformer is incorporated in the Level Control switch possibly? Variable impedance transformer?